There’s nothing quite like a glass of ice-cold lemonade on a hot summer day. Except maybe this citrus smoothie, which is both refreshing and filling. Starting your day with a little lemon juice and warm water is a proven health strategy. It wakes up your digestive system, flushes toxins, and is hydrating. To change things up and get more lemony goodness (pulp and pith are loaded with nutrition) you can blend the whole thing. I’ve been on a serious lemon kick the past month adding either half or a whole lemon into most of my smoothies. I find lemons go particularly well in chocolate smoothies. I’ve also found blending lemons is a little less work than squeezing out the juice and there’s less to compost. This smoothie was a little strong on the lemon taste the first two sips – then it really started tasting good. If you’re sensitive to the taste of lemons or don’t want an overpowering lemon tasting smoothie simply use less lemon. This is a good smoothie to drink slowly, chew (for optimal digestion), and savor. This recipe is pretty basic. There’s a bunch of add-ons to boost the nutrition and alter the taste to better suite your preferences. Berries and cacao are at the top of my list to level-up this smoothie. Add ice to chill. Enjoy! 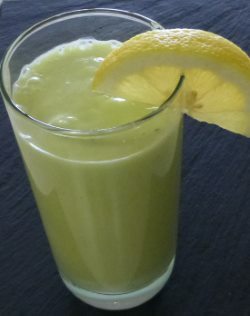 I’d love to know if you try this lemon lime avocado smoothie and what you thought. Please leave a comment below. Happy Blending! I love avocado but this is the first time I have heard this smoothie. I’ll try it. Let me know how it turns out, Lawrence. Thanks for Lawrence. I found some great info about avocado smoothie. I made it and it’s amazing. My son and daughter really like it. Thanks for sharing. Avocado smoothies are my favorite. Nice to hear you and your kids enjoyed this recipe, Cristina. First time to reply but have been enjoying your smoothies since last summer, have not been disappointed yet, I did add chia seeds, maca, cayenne , cholate peanut butter and blue berries. My first with lemon or lime, was there any ingredients I added that would be a bad combo for health reason? Great to hear you’ve been enjoying my smoothies, Fred. I don’t see any issues with those ingredients or their combination. Occasionally, people experience some digestive issues when combining certain foods; so just be aware of that possibility. Love love this smoothie. We have made it now twice. With spinach and goji berries and off course maca and macha powder. The avo gives it a very nice taste. This one will be on my favorite list. Thanks for all the recipes have tried quite a few of them already. Double love for this smoothie quite the endorsement :) Glad to hear it’s one of your favorites, Marita. Spinach, goji berries, maca, and macha are all excellent add-ons. This was a GREAT smoothie! I left the lemon & lime peel on, but seeded the lemon. I added a 1/4 cucumber, a whole avocado, a whole pear, & honey. I did use 1 1/4 c coconut water. It made 2 1/2 servings! Just curious: why do you advise to remove the peel from fruits? The peel from apples, pears, lemons, limes have a lot of vitamins. I never remove the peel from those fruits. Your version of this smoothie sounds delicious, Dalia! I typically advise removing the peel from lemons and limes, and sometimes other fruits, because not everyone is using organic produce. You are right about there being a lot of nutrients in the peel; so please use if you prefer to.